Learning about the lives of important figures in history is just fascinating. Over the years I have started picking up more biographies because of my love of historical fiction. Nonfiction has a bad reputation as boring. This is not always the case. Many nonfiction books now are reading almost like fiction. They flow well and tell a great story. I laughed out loud while listening to Tina Fey read her biography, Bossypants! I was shocked while reading, A Stolen Life, by Jaycee Dugard. I cannot wait to listen to the upcoming autobiography, Becoming, by former first lady, Michelle Obama. Everyone has a story to tell. Browse through our biographies (92s and 920s) and see what catches your eye. 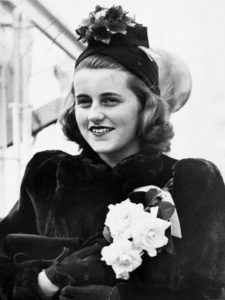 Summary: In her debut novel, author Kerri Maher introduces us to Kathleen “Kick” Kennedy. She is the second oldest daughter of Ambassador Joe Kennedy Sr. While living in London Kick does everything a good debutante is supposed to do. She attends balls, is presented to the King and socializes with the aristocracy. However, she wants something more. When she meets Billy Hartington, the heir to the dukedom of Cavendish, she finds what she has been looking for. Their dreams are derailed when Hitler invades Poland and Kick is sent back to the United States. She becomes even more determined to return to England and the man she loves even if it means defying her family and her religion. Highlights: A fantastic example of biographical fiction! Everyone in the U.S. has grown up hearing about John F. Kennedy and his family. However, I had never heard of his sister, Kathleen. I was fascinated by her story. She was a young debutante who was practically American royalty. She lived in England and fell in love with the heir to a dukedom. Her life though was not perfect. She had many struggles in her life. My heart broke for her when her family and society were against her relationship because she was Catholic and he was Protestant. 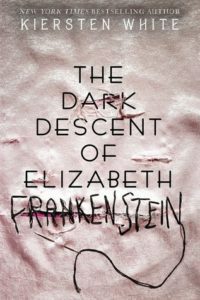 The author does a great job of bringing her confusion and inner battles to the reader. I cannot imagine how hard it must have been for her to make a choice between the man she loved and her family. I liked this look into the life of the Kennedys. Her parents were very strong willed and wanted their children to achieve great success, which several of them reached. Kick became the rebellious one who followed her heart. 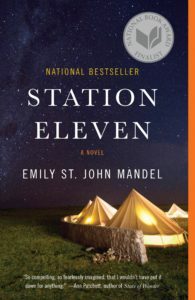 I was nearly in tears (which rarely happens) while finishing this book. The family became so real on the pages and their heartbreaks became mine as well. This was wonderfully researched and written. I cannot wait to see what Kerri Maher writes next! Lowlights: While I appreciated the insight into Kick’s years of separation from Billy and the personal struggle to come to terms with what life with him would entail, I felt that it stretched out a little too much. For several chapters we watch as she continues to debate and think about her choices. I felt that this made us understand how important it was but at the same time, it slowed the plot down. 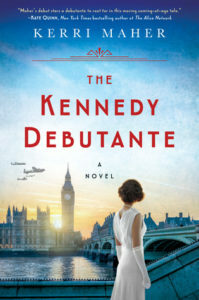 FYI: If you love the Kennedys or World War II historical fiction than I would highly recommend this! I love to buy books! I think many of us here at the library have this same problem. I want to have copies of my favorite books on hand in case I want to reread them or to decorate my apartment. So when a big book sale is going on I always try and get there to pick up a few treasures. The library has a running book sale but every so often we have more books than we know what to do with. That is when we have a bag sale! What is better than getting a Derby Library bag stuffed full of new and old books?! 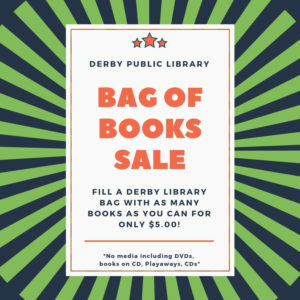 We currently have this sale happening at the library running through November 3rd. Come in and see what is here. New books are added every day. 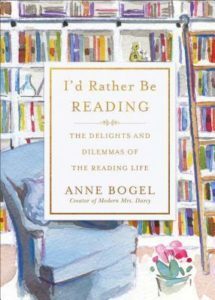 Summary: Told through a series of essays by author and blogger, Anne Bogel, we get a look into what makes reading a full time hobby of hers. She gives the reader tips on how to organize their bookshelf, tells us what got her hooked on reading and the love of her library next door. This cute little book is perfect for the book lover in your life! 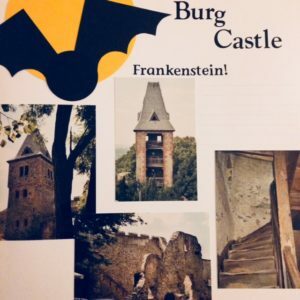 Highlights: I recently started following Anne’s blog (Modern Mrs. Darcy) and her Instagram account. She LOVES books and everything book related. This short little book was quick read that is easily relatable. She knows exactly what it means to be a book lover. I felt like she was talking directly to me. Moreover, learning that I am not the only one who is obsessed by reading and all things books. I loved her idea of a book twin. Someone who has similar reading likes and dislikes. Someone who can vet books for you and you for them. Her tips and tricks make me want to reorganize my bookshelves and add more shelves too. I never even considered having shelves dedicated to authors I have met or organize based on colors. Lowlights: The essays are nothing groundbreaking but are a fun read that are easy to connect with as a reader. FYI: The author also has a podcast, What Should I Read Next. October is here! The fall weather is arriving and Halloween is approaching. That means bring on all the scary movies and books. We have a great selection of horror movies and Halloween classics. I recently watched the previous season of American Horror Story and really enjoyed it. I always watch Hocus Pocus several times during the month of October and pick up several spooky books to get me into the holiday spirit! First line: Washington Irving got it wrong. Summary: When schoolteacher, Ichabod Crane, comes to the village of Sleepy Hollow he meets the daughter of a wealthy farmer. Their friendship and shared loved of books and music lead to a love affair that will sweep them both off their feet. Katrina’s admirer, Brom Van Brunt, is determined to win her and scare off the newcomer. Then on All Hallow’s Eve Ichabod disappears without a trace. 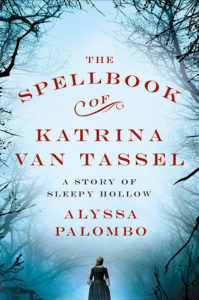 Katrina enlists the help of her friend and rumored witch, Charlotte Jansen, to assist in finding Ichabod using any means necessary. Highlights: I really enjoyed this book. It was fun twist on the original classic. I have seen the movies and loved the TV series. However, this was just different enough from them that it made it fresh and new. The book is a mix between historical fiction, romance and ghost story. There were lots of interesting details about the time and culture of the Dutch settlement in Sleepy Hollow. The romance was a main theme but it was not a bodice ripper by any means. I loved the dark undertones of the Headless Horseman haunting her dreams and roaming the village on All Hallow’s Eve. This is a great read for October! Lowlights: The story seemed to drag on a little bit in the middle. In addition, I think that title is a little misleading. I expected more witchcraft and magic. Katrina and her friend, Charlotte, do seem to have some sort of second sight but it was not what I had expected. FYI: If you like this then try the author’s other book, The Most Beautiful Woman in Florence.